Regretfully, I only got to sample one of these heavenly scented cupcakes before shipping them out to my daughter's school. I signed up to bake once a month for hot lunch days. Which is good, because if these had stayed in the house, I would have eaten them all myself. Well, maybe I would have to fight my husband for them. He loves ginger too. I like that the cupcakes were light an airy. I wanted to add a light fluffy frosting like my Cinnamon Mascarpone Frosting, but that would require the cupcakes to stay refrigerated, so it wouldn't work in this case. I did use mascarpone cheese anyway, but in more of a buttercream style frosting. I may or may not have squeezed the contents of my pastry bag into my mouth as I savored the creamy mascarpone frosting. I think I will just blame it on the Elf on a Shelf. I have seen him get into all sorts of trouble on Instagram. He made me do it. 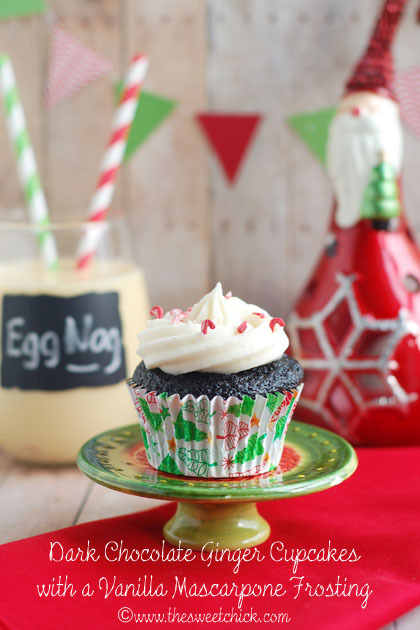 These go great with a tall glass of eggnog. Go ahead and make some for your holiday party. Preheat oven to 350º F. Line muffin tins with cupcake liners. In a large bowl, sift together sugar, flour, cocoa, baking powder, baking soda, ginger, cinnamon, cloves and salt. In a stand mixer place eggs, milk, molasses, and oil. Mix on low for about 1 minute. Add dry ingredients to wet ingredients and mix on low for about 3 minutes until all incorporated. Stir in boiling water and carefully mix on low until batter is smooth (batter will be thin). Pour batter into prepared muffin tins using a small ladle, until 3/4 full. Bake at 350º F for 15 minutes or until toothpick inserted in center comes out clean. In a stand mixer, cream together the mascarpone and butter until well combined. Add powdered sugar 1 cup at a time, stirring in between. Add eggnog (or milk) and vanilla. Mix on medium until all incorporated and smooth. Frost cupcakes anyway you like, with a piping bag or a spatula. Feel free to add sprinkles. Then go ahead and peel one open and take a bite! Hi, nice to meet another Carole. I did go ahead and link these cupcakes for Food on Friday. Thanks for the invite. 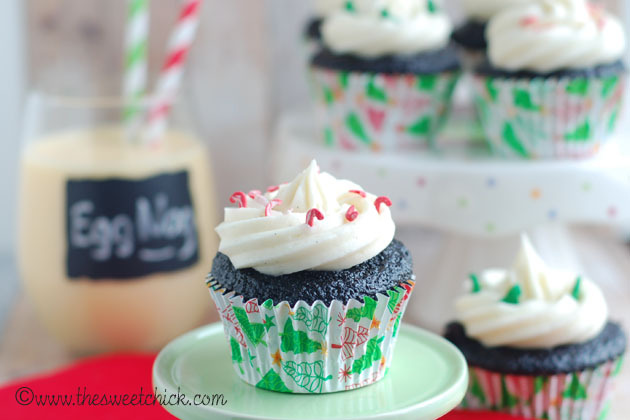 These cupcakes are so gorgeous, and wonderfully festive! And I can't get enough of the chocolate-ginger combo. Thanks. I can't get enough of it either. I have a few more ideas. Your welcome. Yes, I did sign up to follow on GFC. I do love the chocolate and ginger combo, as well. These little cupcakes look perfect. Thank you for sharing! Thank you. 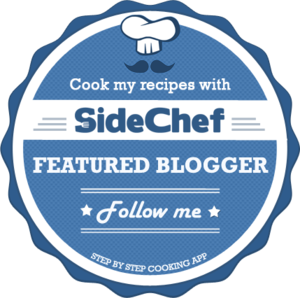 I think you have quite an array of delicious recipes yourself on hubpages. Yummy cup cakes... kudos to your patience.. Cupcakes look perfect.